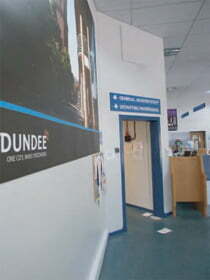 As part of Dundee Airport’s ongoing improvements program, Hampton’s were asked to assist with some internal refurbishment of the main terminal building. The work included the construction of room partitions to enable a new passenger walkway & processing area to be created with customised security doors. 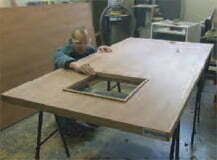 A number of worktops and an access hatch also needed to be installed. Wall mounted containers and storage boxes to hold various passenger processing items such as tickets and luggage markers were also requested by our client. Working within what is a secure airport environment and due to time limitations, the work had to be carried out while the airport was operational. Throughout this construction, airport passengers as well as the airport staff needed to walk near the areas being worked on. Particular attention therefore had to be paid to health and safety during the construction work to ensure the safety of the public. 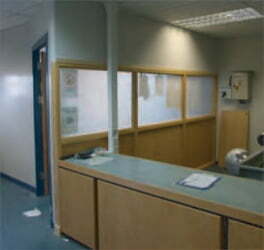 Any potential hazards were removed or minimised and all working areas carefully controlled. The work was completed over a two week period using a two man team. The custom built wooden security doors were hand made at our joinery workshop in Dundee.